The best of both worlds. 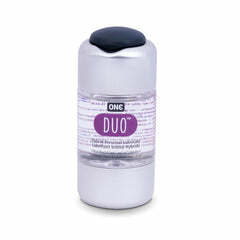 ONE® DUO® Lubricant combines the advantages of water-based and silicone-based lubricants into a super-concentrated hybrid formula. No gluten, DEA, PEG, hormones, oil, artificial dyes or fragrances.